فخریان روغنی, عباس, یزدانی, رسول, قاسمیان, علی, رسالتی, حسین. (1395). ارزیابی پتانسیل گونه کهور پاکستانی (سمر) در خمیر کاغذ سازی کرافت. مجله صنایع چوب و کاغذ ایران, 7(1), 43-54. عباس فخریان روغنی; رسول یزدانی; علی قاسمیان; حسین رسالتی. "ارزیابی پتانسیل گونه کهور پاکستانی (سمر) در خمیر کاغذ سازی کرافت". مجله صنایع چوب و کاغذ ایران, 7, 1, 1395, 43-54. فخریان روغنی, عباس, یزدانی, رسول, قاسمیان, علی, رسالتی, حسین. (1395). 'ارزیابی پتانسیل گونه کهور پاکستانی (سمر) در خمیر کاغذ سازی کرافت', مجله صنایع چوب و کاغذ ایران, 7(1), pp. 43-54. فخریان روغنی, عباس, یزدانی, رسول, قاسمیان, علی, رسالتی, حسین. ارزیابی پتانسیل گونه کهور پاکستانی (سمر) در خمیر کاغذ سازی کرافت. مجله صنایع چوب و کاغذ ایران, 1395; 7(1): 43-54. 2دانش‌آموخته کارشناسی ارشد علوم و فنّاوری خمیر و کاغذ دانشگاه علوم کشاورزی و منابع طبیعی گرگان، گرگان، ایران. در این تحقیق ویژگی‌های فیزیکی، بیومتریک، شیمیایی چوب کهور پاکستانی(سمر) و ویژگی‌های فیزیکی و مکانیکی خمیرهای کاغذ کرافت آن مورد اندازه‌گیری و بررسی قرار گرفت. وزن مخصوص خشک و بحرانی گونه سمر به‌ترتیب برابر 0.806 و 0.696 گرم بر سانتی‌متر مکعب برآورد گردید. طول الیاف این گونه 895 میکرون و میزان سلولز48.80، لیگنین23.66، مواد استخراجی 3.88 و خاکستر آن 1.10درصد اندازه‌گیری شد.شرایط تهیه خمیر کاغذ کرافت گونه سمر(کهورپاکستانی) عبارت بودند از: قلیائیت مؤثر14، 16، 18درصد، زمان پخت120 و 180دقیقه، درجه حرارت پخت 170 و 180 درجه سانتی‌گراد و نسبت L/W برابر 5 به 1. بعد از اندازه‌گیری مقادیر بازده و عددکاپا، خمیر کاغذهای حاصل از 2تیمار انتخاب و درجه روانی آنها به‌وسیله عمل پالایش به‌حدود 400 (CSF) رسانده شد. آنالیز نتایج بازده و عدد کاپای خمیر کاغذها با استفاده از آزمون فاکتوریل در قالب طرح کاملا تصادفی، مقایسه میانگین آنها از آزمون دانکن و آنالیز مقاومت‌های کاغذهای دست‌ساز از آزمونT-Test انجام گرفت. نتایج نشان داد که کاغذهای دست‌ساز حاصل از خمیرکاغذ کرافت تهیه شده تحت شرایط قلیائیت مؤثر 18 درصد، زمان پخت 120 دقیقه و دمای پخت180درجه سانتی‌گراد، دارای ویژگی‌های مکانیکی بهتری بودند. نتایج بررسی مشخص نمود که گونه سمر(کهور پاکستانی) منطقه جنوب کشور در مقایسه با سایرگونه های پهن‌برگ، از ویژگی‌های مناسبی برای تهیه خمیر کاغذ کرافت برخوردار می‌باشد. Ghasemi, A., Hydari, H. and Azadfar, D., 2009. The Effect of The Physico-Chemical Properties of Soils in Water Spreading Zone on Common Mesquite Tree Vegetative Characteristics in Tangestan, Bushehr Province. Wood & Forest Science and Technology, 18(1): 117-122. (In Persian). Nahali Tahmasebi, M., 2000. Pakistan mesquite ecological assessment to produce compost in the province Hormozgan. Agriculture economy and development. eighth year, 31:305-323. ( In Persian). Saleheh Shooshtari, M. H., Amani, M., Behnamfar, K. and Nanaie, S., 2008. Survey on optimum planting spacing with three leguminous species in rain fed system (pure and mixed) on sandy hills of Khouzestan. Iran. Iranian Journal of Forest and Poplar Research, 16 (1): 74-86. ( In Persian). Zaboli, A., 2013. Iran's largest mesquite forests under threat. ww w.farsnews.com /newstext.php?nn=13911015000062. ( In Persian). Guha, S. RD. and Gupta, RK., 1970. Production of writing and printing papers from Prosopis juliflora. Journal Indian Forester, 96 (6): 429-32. Toghraie, N., Riyahi, H. and Hosseinzadeh, H., 2005. A study of mesquite wood (Prosopis spicigera L.) in Khuzistan, Iran. Pajouhesh & Sazandegi, 73:117-122. (In Persian). Carrillo-Parra, P., 2007. Technological Investigation of Prosopis Laevigata Wood from, Faculty of Forest Sciences and Forest Ecology of the University Northeast Mexico. Doctor of Phlosophy of Göttingen, 137 P.
 Ogunwusi, A. A., 2012. The effect of chips storage on pulp and papermaking properties of mixed tropical species. Journal of research in national development, 10 (2): 18- 25. Choudhury, K.C., Sridhar ,P., Agarwal naveen, Singh amar and Raina, R.L., 2008. Selection of alternate raw material among the locally available species. IPPaTTA, J., VOl. 2: 119 P.
 Franklin, G. L., 1954. A rapid method of softening wood for microtome sectioning Tropical Woods, Wood 88: 86-88. Rashidi, M.,2002. Investigate the chemical kraft pulp produced from eucalyptus wood and replaced them with long fiber pulp CMP to improve the quality of imported newsprint in Mazandaran Wood and Paper. Master's thesis, Dept. of Forestry, Gorgan University of Agricultural Sciences and Natural Resources,63 P.(In Persian). Sepidehdam, S. J., 1998. Investigation on properties of NSSC Pulp from Eucalyptus camaldulensis wood grown in Zaghmarz & Fars province. Wood and Paper Research, Islamic Republic of Iran, Ministry of Jahad-e-Keshavarzi, Research Institute of Forest and Rengelands, 182:65- 148. (In Persian). Mahdavi, S., Hosseinzadeh, A., Familian, H. and Habibi, M. R.,2004. Investigation on relation of fiber dimention and wood density with age and ring width in Eucalyptus camaldulensis Dehnh. Islamic Republic of Iran, Ministry of Jahad-e-Keshavarzi, Research Institute of Forest and Rengelands, 19 (1):69-97. (In Persian). Higgins, H.G. and Puri,V., 1976. Chemitermomechanical pulp from young Eucalyptus. Ist Latin Am. Congr. On pulp and paper, Buenos Aier-Argentin. 3: 39-46. Sharifi, S., 1386. Evaluation of mechanical properties of jumping E. camaldulensis trunks of Jiroft province and Experimental pulping neutral sulfite semi-chemical method(NSSC). Master's thesis, Dept. of Forestry, Gorgan University of Agricultural Sciences and Natural Resources. 113 p. (In Persian). Mirshokraei, S. A. and SAdeqifard, H.,2002. 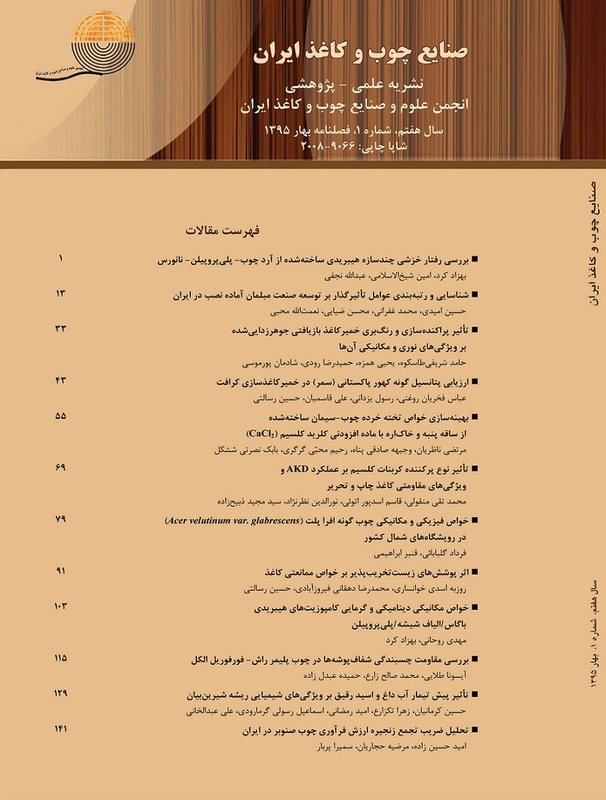 The Chemistry of Paper, Ayyzh publications, 184 p. (In Persian). Mirshokraei, S. A., 1997. Handbook for pulp and paper technologists,. Payamenoor University, 80p. (In Persian). Ahmed, A., Akhtar, M. M. and Gary, C. S., 1998. Kraft pulping of industrial wood waste. Pulping Conference, October 25-29., Queen Elizabeth Hotel, Montreal, Quebec, Canada, Atlanta, GA : TAPPI Press. P 993-1000. Khristova, P., 2000. Pulping potential of some exotic hardwoods grown in Sudan. Tropical Sci,40:11-19. Khristova, P., Kordsachia, O., Patt, R. and Dafaalla, S., 2006. Alkaline pulping of some Eucalyptus from sudan. Bioresource Technology,97: 535-544. Bosia, A. and Lorenz, C., 1965. Paper making properties of six further species of Eucalyptus, Cellulosa Carta,16 (9): 7-27. Fakhryan, A., Hosseinzadeh, A., Golbabaei, F. and Hosseinkhani, H., 2004. Investigation on Delignification and pulping of Spruce(Picea abies). Islamic Republic of Iran, Ministry of Jahad-e-Keshavarzi, Research Institute of Forest and Rengelands, 18 (2):219-239. (In Persian). Bosia, A.,1963. Pulping and Papermaking Properties of Fast Growing plantation wood species. The FAO technical papers. 1:10-19.